26 dead, 12 injured as truck skids off in Gujarat's Bhavnagar - Integration Through Media ....! 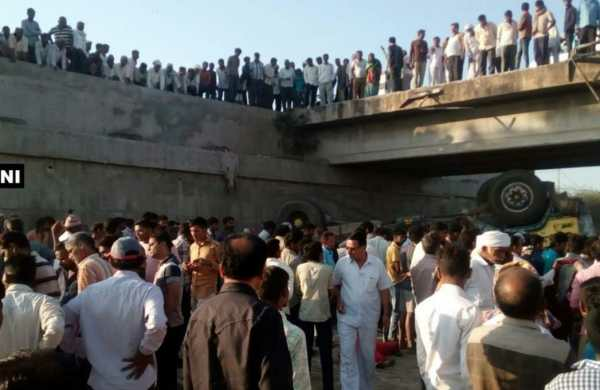 At least 26 persons lost their lives and 12 others suffered injuries in Gujarat's Bhavnagar after the truck in which they were travelling lost control and skidded off into a drain, reports ANI. According to reports, the truck was taking a marriage party at the time of the incident. The accident took place on the Rajkot-Bhavnagar state highway. Senior police officials are inspecting the spot and reviewing the rescue operations. Those who are critically injured are hospitalised for treatment.